Las Vegas, NV (January 8, 2014) – This year at the Consumer Electronics Show (CES), InHand Electronics, a leader in embedded systems customizable rugged tablets, teamed up with biometrics company, Biometrica, to showcase the latest in technology’s durability and digital security. At booth #35856, InHand showcases the Hydra-F6 (HF6) tablet – touted as “nearly indestructible”- with one tablet submersed in a fish tank, completely functional. The company also uses the HF6 to demo Biometrica’s new Pocket Iris camera, the latest trend in digital security. Self-proclaimed as the most durable 7”, sunlight-readable tablet on the market, the HF6 is built around InHand’s own Fury-F6, Freescale i.MX6 -based single board computer. The MILSPEC device provides a full range of standard peripherals, up to 10 hours of run-time, and weighs less than 25 ounces. While the tablet is available off-the-shelf, the company also offers comprehensive engineering and design services for customization of the HF6 for application-specific requirements. 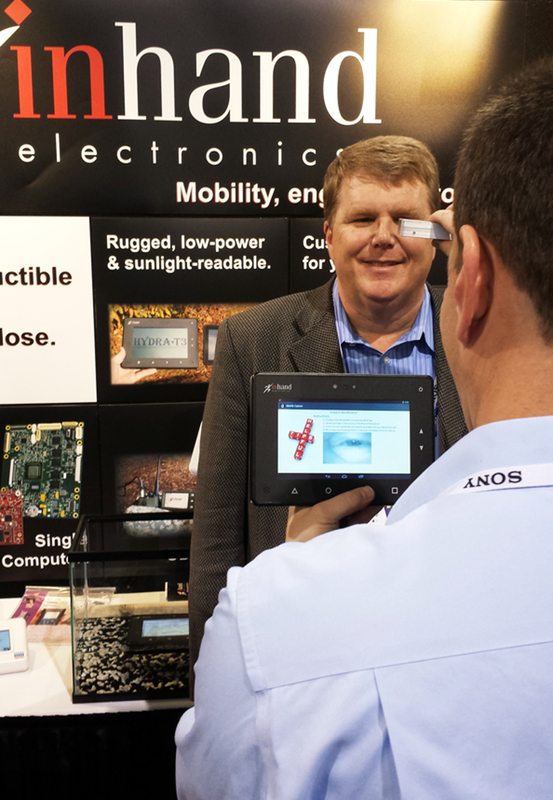 Tethering the HF6 to Biometrica’s Pocket Iris via USB, InHand demonstrates the power of both technologies for CES attendees. The compact iris camera is one of the smallest iris scanners in the new biometric security market (measuring 3.3”x.8”x1.4”). The camera’s technology automatically identifies optimal distance for optimal imagine capture to facilitate a rapid biometric verification and identification – under five seconds. The device can be used to lock data – over 100 times more effectively than fingerprint scanning – limiting control and increasing digital security. Iris images can be used for personal verification, watchlist ID, single sign-on applications, and password management. The new technology also enables developers to create new biometric-enabled applications. For more information on InHand and the Hydra-F6, visit www.inhand.com. For more information on Biometrics and the Pocket Iris camera, visit www.biometrica.com. For more information on CES, visit www.cesweb.org. InHand Electronics, Inc. is an original design manufacturer of single board computers and rugged handhelds for original equipment manufacturers. InHand’s products are used in a variety of markets including: military, healthcare, industrial, entertainment, and instrumentation. Designs include: UMPCs, PDAs, wearable computers, tablets, handheld control systems, industrial computers and smart sensors. InHand’s products are built on industry-leading technologies such as: Freescale, Intel, Texas Instruments, and Marvell processors and Android, Linux, Ubuntu, and Microsoft operating systems. InHand is an ITAR registered company. InHand products are designed and assembled in the USA. The company’s headquarters are located along the I-270 Technology Corridor in Rockville, Maryland. Biometrica has long been the acknowledged market leader in casino surveillance, with a suite of innovative technologies that build on facial recognition capabilities to enhance security. It is now bringing those innovations to a broader market. The company has advanced the technology of iris and facial imaging and recognition to make biometric security practical, accurate and affordable. Breakthrough solutions offer the unquestioned accuracy and simplicity. With a sleek, streamlined, flexible and user-friendly solution, Biometrica makes mainstream deployment of biometric enterprise security systems not just feasible, but highly advantageous. For more information, visit www.biometrica.com.